Avenged Sevenfold News: Dallas Observer: "Avenged Sevenfold is one of the best bands in America"
Dallas Observer: "Avenged Sevenfold is one of the best bands in America"
Often erroneously lumped into softer, newer corners of the heavy music world, California’s Avenged Sevenfold are much more influenced by the old school metal of Judas Priest and Thin Lizzy than some realize. And that was on display Saturday night at the American Airlines Center as the band (plus a couple of outstanding warm-up acts) delighted an arena full of fist pumping, black-clad metal heads. Guitarists Synyster Gates and Zacky Vengeance displayed the same kind of in unison fire power of Judas Priest’s K.K. Downing and Glen Tipton. 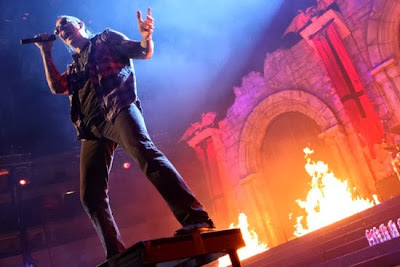 Indeed, on “Nightmare,” one of Avenged Sevenfold’s best songs, the interlocking guitar play was very reminiscent of early Judas Priest. 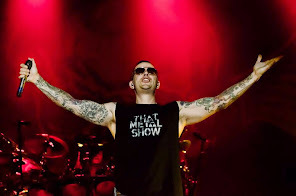 Avenged Sevenfold is simply one of the best bands in America, metal or otherwise. The band’s music is layered and intense, free of pretense and full of genuine emotion. When Shadows dedicated “Fiction” to the late James Owen Sullivan (aka The Rev), the vibe in the building was celebratory instead of depressing. Interestingly, when Shadows acknowledged the two supporting acts, many boos were audible at the mention of Ghost BC. Seems it’s OK to throw down the f-bomb, but not any references to the devil, at least not in the bible belt. In the end, however, area metal heads got everything they could have wanted from a trio of bands that show the range and power of first class heavy metal.